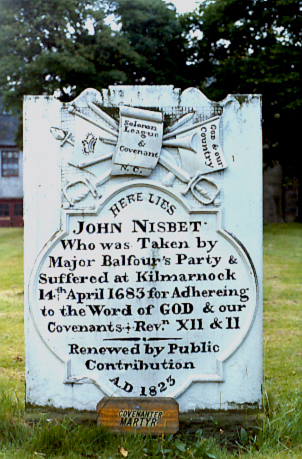 John Nisbet's gravestone is located on the north side of the Laigh Kirk (now known as the New Laigh Kirk) in the surrounding graveyard. The church is located in the centre of the town, with access to the graveyard from John Dickie Street. A circular granite memorial is located on the floor of the Burns Mall shopping centre in Kilmarnock, marking the spot where Nisbet was executed. John Nisbet the Younger was a native of the parish of Loudoun, east of Kilmarnock. He accused of being at the Battle of Bothwell Bridge. He was captured by Major Balfour and taken to Kilmarnock where he was sentenced to be executed. No-one had been executed in Kilmarnock before, and it was thought by the authrities that by executing Nisbet in public might result in the locals adhering to their demands. This took place at Kilmarnock Cross on 14 April 1683. Prior to his execution he prayed, sang part of the sixteenth psalm and read the eighth chapter of Romans. The crowd that came to hear him was so great that some went onto the roofs of nearby buildings in order to hear him. His body was later buried in the Laigh Kirkyard, where a headstone marks his grave.